Where Does Grocery Store Produce Come From? Your supply of store-bought produce has lived a long journey before it reaches your table. If you’re buying from a large retailer, your fruits and veggies have likely crossed state lines, traveled highway to highway and hopped from storage unit to storage unit. It has also endured several handling changes before reaching its destination distribution center, and eventually, to your local grocery store. Fresh produce typically spends up to half of its shelf life in transit from supplier to retailer. But exactly how many “food-miles” do your groceries actually travel? You’ve probably heard the statistic that produce travels an average of 1,500 miles before it gets to your local retailer. But the meaning behind this oft-quoted figure is more complicated than it appears on the surface. The “1,500 miles” statistic can be traced back to a 2001 study used in reference to how produce moves to the Chicago terminal market hub from Iowa and surrounding upper-midwest states. 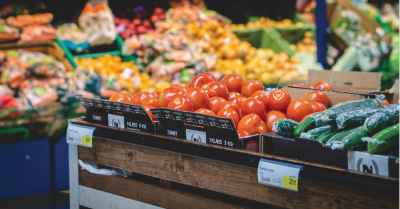 And if you live in a food desert, with limited access or proximity to grocery stores, the distance it takes for produce to arrive to the closest possible retail grocery outlet is even longer. North Carolina’s rate of fruit and vegetable production ranks 17th and 10th out of all U.S. states, respectively, but much of that produce is not distributed locally. For example, one study found that despite the fact that there are 65 farmers markets serving local produce in 14 counties surrounding Charlotte, residents are spending more money—a gap of millions of dollars more per year—buying produce that is not grown locally. This is because large retail chains carry produce from all over the country, but those sources are often not local. Factor #2: Is There A Grocery Distribution Center Near You? The answer to the food-miles question also depends on the amount of grocery distribution centers located in your area. Overwhelmingly, the east coast is host to the bulk of distribution facilities in the U.S., intentionally in line with Census Bureau statistics that measure population density. But in the midwest, which is one of the most significant areas of agriculture production globally, the amount of distribution centers are few and further between—even despite the fact that midwestern states are home to the most farms per 1,000 people. Similarly, North Carolina is home to lots of local farmers, but the number of grocery distribution centers based in our state is not proportional to the volume of fruits and vegetables those local farmers produce. As a sample: Harris Teeter only has grocery, frozen food and perishable distribution centers in Greensboro, Indian Trail and High Point; Lowes Foods has centers in Garysburg, Statesville, Mooresville and Wilkesboro; and Walmart’s four North Carolina distribution centers are based in Mebane, Shelby, Henderson and Hope Mills. In North Carolina, there is a higher demand than supply for certain fruits and vegetables. Items like lettuce, tomatoes and broccoli are in short supply in our state. So if you’re buying any of these items at large retailers, your groceries are probably coming from outside of North Carolina—which means: they may be traveling thousands of miles in order to get to your city. However, since North Carolina ranks first in nationwide sweet potato production, your closest retailer probably carries a heavy supply of locally produced sweet potatoes. Food-miles also depends on whether or not the item is in season. In North Carolina, many popular fruits and vegetables are grown in the summer months, including blueberries, watermelons, cantaloupes, blackberries, plums and pepper. Sweet potatoes, herbs, collards and peanuts are grown year round. Some crops are only available fresh for about a month, including onions, carrots and green peas. So, how long does it take for your produce to arrive from the farm to your nearest retailer? Well, it depends what you’re buying, where you live and how big the population of your city is. If you’re looking for an alternative to buying your fruits and veggies from large retail chains, you can always skip the store and order a fresh supply of produce online. You’ll also be supporting local farmers and get your fruits & veggies straight from dirt to doorstep in doing so!